Some food is so simple and tasty to make that I cannot understand why people buy it. Purchasing egg nog, for instance, is akin to buying pre-toasted bread. 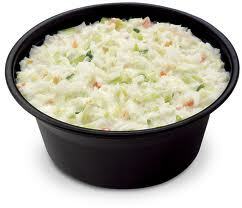 Cole Slaw is another of these easy foods people buy, and there's another problem with most cole slaw: its made wrong. Cole Slaw is one of the staples for cook outs, picnics, potlucks, and so on that can be made. Its tasty, pretty good for you, stores well, and is liked by most people. And its very easy to make. The problem I have with slaw in most restaurants is that they make it sweet, which is just wrong. I understand why; they're trying to counter the bitterness that cabbage can have, but it just isn't necessary. That's the base, and with it you can build many varieties as I noted in RMC12. So on to the slaw. Take a head of green cabbage, and decide how much slaw you want. Half a head is good enough for a family and a day or two of leftovers in most cases. Take the amount you desire cut it into small chunks, about an inch square. Toss as many chunks as your blender can fit, minus about an inch of space at the top. Pour in water until the cabbage is covered and floats. Now, use the setting on your blender that runs as long as you hold the button down and give it one-second pulses, and peek at the cabbage through the side. You know what cole slaw looks like, so you're looking for the cabbage to be chopped into pieces about that big. Pulse it until you get what you want, then drain the cole slaw in a strainer. This will give you the classic little squares like confetti. Now, note, you can do this by hand but its going to take longer and be a lot of work. You can even use a grater, but its a bit of a pain with leaves like cabbage has. This is the best way to get the more fancy strips of cole slaw that some prefer, though. Once the cole slaw has fully drained, dump it into a sealable container you can fit it all in. Start spooning in ranch dressing, one at a time, and mix it up. It doesn't take a large amount of dressing to cover the whole batch, but the amount needed is going to vary by the thickness of the cabbage and how much you used. Once you get a good coating on the cabbage and its all pretty moist, close it up and store it. Cole Slaw is best if it marinates a day or so, but it can be eaten right away. You can put variants in your cole slaw, such as red cabbage, carrot bits, celery, even celery seeds. Since this is a salad you can get pretty creative and not ruin the recipe, just don't add too much sweet stuff or it not only ruins the flavor, it causes problems for people with diabetes and so on, and you want to be a good host. That's it. Dressing+blended cabbage, salt to taste - it will take a fair amount. You're looking at about 10 minutes of effort to make, then some cleanup. This cole slaw will be very welcome at your next gathering, perhaps along with some deviled eggs or mistral salad. Enjoy!